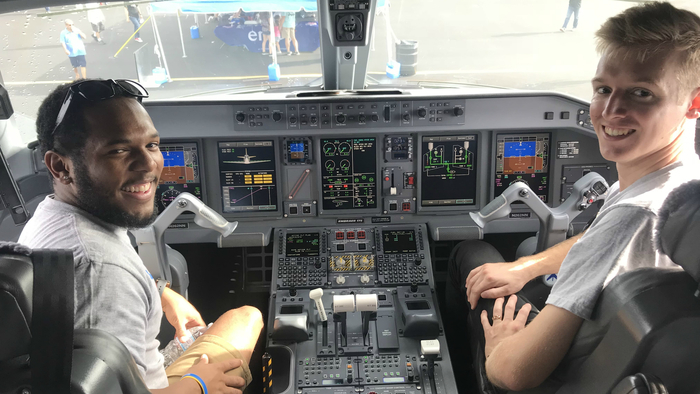 Last year, American Airlines introduced its Cadet Academy that provides student pilots an opportunity to train at hand-picked flight schools and get them on their way toward becoming an airline pilot. After completing their Academy training, the student pilots choose to join one of American’s wholly-owned regional airlines as a Cadet Flight Instructor. We were very much honored when news came that the very first Academy cadet chose Envoy! Born and raised in the Washington, D.C. area, Cadet Keith Taylor, 25, will begin his job as a Flight Instructor at American Flyers in Pompano Beach, Florida. 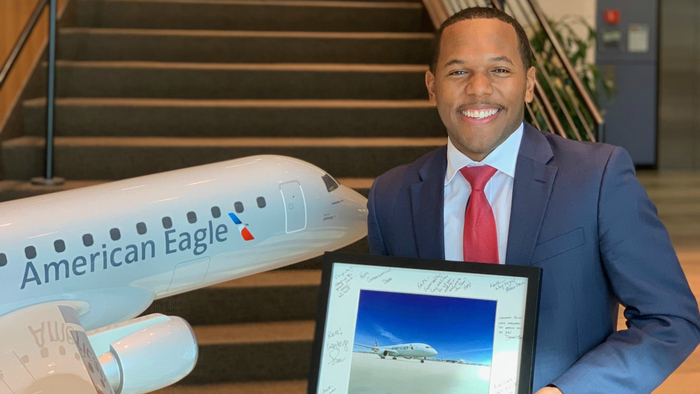 Below, Keith explains his love of aviation and why he chose to fly for Envoy. 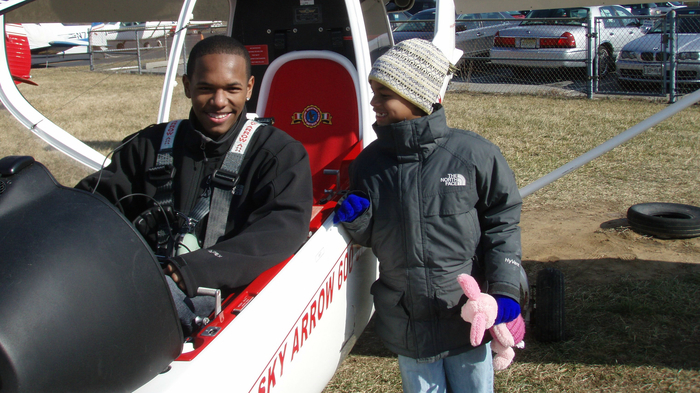 Cadet Keith Taylor with his little brother after his discovery flight in 2014. When did you know you wanted to be a pilot? Why? As long as I can remember I wanted to be a pilot. As a child, my mother used to take me to the park near Reagan National Airport in Arlington, Va. where we used to watch the planes take off and land; I thought it was the coolest thing ever. Being a pilot is one of the few jobs where you get paid to travel the world. You play an important part in people’s lives by helping them reach their destinations safely – plus, you get to go really fast! When and where did you do your discovery flight? On which aircraft? I took my discovery flight when I was 14 years old at the Bay Bridge Airport in Stevensville, Md. The first airplane I ever flew was a Sky Arrow. I remember the first time sitting in the pilot seat and feeling at home, knowing this is what I was destined to do. I recall going up in the practice area and flying around for 30 minutes — it was absolutely amazing! When we landed, needless to say, I could not stop smiling — It was one of the happiest moments in my life. My parents subsequently set up weekly lessons for me to begin pursuing my dream of becoming an airline pilot. Where did you go to college and where did you do your Cadet training? I attended college at Jacksonville University where I double majored in Aviation and Political Science. I received my undergraduate degree in 2015 and subsequently received my Masters in Business Administration in the fall of 2016. I was accepted into the American Airlines Cadet Academy in August 2018 where I began training at American Flyers in Pompano Beach, Florida. I begin training on the Cessna 172 for my commercial pilot certificate, Diamond Da-42 for my multi-engine rating add-on, and in November 2018, I received my Flight Instructor Instrument certificate. Keith with a friend on the flight deck of an Envoy Embraer 175 at the Wings Over Homestead Air Show. Why did you choose to fly for Envoy? There are multiple reasons why I chose to join the Envoy family. The rich history and tradition that Envoy holds within the aviation industry dating back to the days of its American Eagle name is unparalleled. Envoy pilots are regarded as some of the finest, smartest and brightest pilots within the profession, and I wanted to join those ranks. After speaking with my pilot mentor, he informed me that Envoy is the regional that most closely resembles American Airlines policies and procedures. If my ultimate goal is to fly for American, then Envoy is the best regional airline to set you up for that success, he told me. Everyone I spoke with pointed me toward Envoy — the Envoy Cadet Program Manager, a recruiter from the American Airlines Cadet Academy, and my mentor. What’s your favorite part about flying? The scenery – you get a different perspective, love and appreciation for the world around us. One of my favorite phases of flight is the final approach into landing. I really enjoy looking out and seeing how life operates on the ground. The approach is truly beautiful; there are no clouds in the sky, the clear ocean is 500 feet beneath you, and you are lined up perfectly on the centerline. Do you enjoy Flight Instructing? I thoroughly enjoy flight instructing because I am teaching and helping develop the future aviators of tomorrow. It is a crazy thing to think that I am training a future airline pilot who may one day fly thousands of people around the world. Flight instructing is also amazing because I get to share my passion and love for aviation with others. You also get to meet people from different walks of life, with varying backgrounds and life experiences. Keith at Envoy Headquarters on the day of his interview for the Envoy Cadet Program. What advice do you have for pilots interested in becoming airline pilots? The advice that I would give is to just go and pursue your dream. Take a chance and bet on yourself as we only have one life to live, so live it to the fullest. I would advise anyone to take a break, dream and visualize yourself as an airline pilot flying an approach or taking off from your favorite airport, and use that as motivation to keep pushing until you finally reach your goal. What are you looking forward to the most as a First Officer at Envoy? The thing I am looking forward to most as a First Officer is stepping into the cockpit and walking through the airport in my pilot uniform. When I see pilots now, I think they are superheroes. I am also looking forward to working with some of the best pilots in the world, and trying to learn as much as I can from them to improve my aviator skills. Lastly, I am looking forward to delivering world-class hospitality and customer service to our passengers. 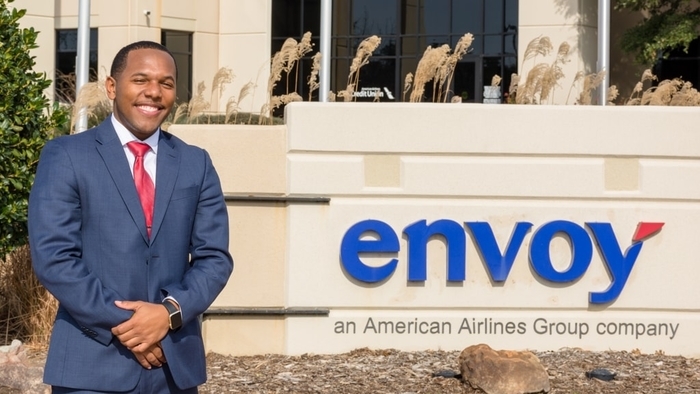 I want to give them the ultimate airline experience as I, along with my future coworkers, help Envoy remain as the best regional airline in the world. Interested in joining our Cadet Program just like Keith? Check out our Cadet page!